Not everyone who uses our Service will see themselves as being disabled, the University uses this term however to cover the barriers faced by people with a wide range of physical and sensory impairments, including specific learning difficulties, enduring health conditions and mental health difficulties. We are here to help you get the best out of Bangor. We can provide advice and guidance on a range of disability-related matters. We aim to provide a quality service which ensures the full inclusion of disabled students within the academic and social community, enabling you to engage with your studies and to function in the wider university environment. To view our full Service aims and objectives, click here. Our offices are open between 9:00am and 5:00pm. It is advisable to contact Disability Services on 01248 383620 / 382032 or email disabilityservice@bangor.ac.uk if you wish to make an appointment with one of the Advisers. Ideally you will contact us during your application process to ensure that arrangements can be put in place promptly, but you are welcome to get in touch any time during your course. Parts of Bangor are hilly so if this could cause you difficulties it may be an idea to familiarise yourself with the area before starting university life with us. If you have specific questions regarding the area, please contact us. 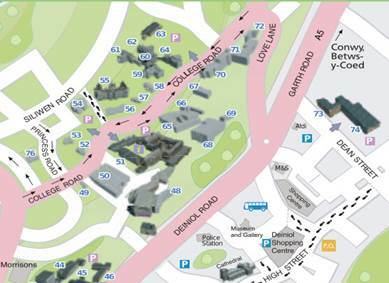 Getting Around Bangor University is a resource to help you find your way around the buildings with information including on where best to park if you are a blue badge holder and which buildings have lifts. The University’s declared aim is to take all possible steps to remove unnecessary barriers and enable full participation by disabled students in all aspects of University life. For further information on policy and procedure, see the University’s Code of Practice on the Provision for Disabled Students and Strategic Equality Plan. We are pleased to say that the number of disabled students studying at the University has increased over the last few years and our team has grown to meet the demand. We have gained excellent feedback from students and we offer a friendly and professional service.